Arsalan Iftikhar | The Muslim Guy | Editor | Human Rights Lawyer | Arsalan Iftikhar: The Dutchman and the Quran. A clash of civilizations is at the heart of it a clash of allegiances, for a civilization is defined by its pattern of allegiances. Therefore the clash between Islam and the West, is also the clash between what we give allegiance to and what they give allegiance to. It is also one of the best demonstrations of why Islam is incompatible with Western democracies. Western nations expect Muslim immigrants to live by a code that separates civil and religious laws. The Western system assumes that Muslims will accept a division between the political and the religion, relegating religion to the mosque, while otherwise being Englishmen, Frenchmen and Americans. This concept however is innately foreign to the Muslim mind. Nationalism in the Muslim world remains a far weaker force than religion and tribal kinship. That is why the post-Saddam Iraq so easily unwound into extended bloody bouts between Sunnis and Shiites. Most Muslim nations are in any case artificial, Egypt, Pakistan, Syria, the Kingdom of Jordan and their like were the products or the afterbirth of European colonialism. Their rulers may cultivate nationalism, but such nationalism is only skin deep. That is why when Israelis point out that Palestine is an artificial entity, the average Arab will only shrug. He knows quite well that just about any country in the Muslim world is an artificial entity, a set of borders drawn out by England or France or a UN mediator with an ancient name thrown into the bargain. The Muslim has only a short term national history, often under Western backed dictators, or a very long one to the romanticized glory days of ancient history. He does not care nearly as much for his nations, as he does for his religion. Mohammed’s real achievement was to take the Arab tribal system and transcend it with a higher identity, that of Muslim. The resulting wave of bloody conquests would not have been possible without that Muslim identity. And that is the problem now facing the West. Nationalism among Muslims is a very shallow thing at best, as Iraq has shown. And that nationalism is primarily based on tribal kinship. Yet Western countries seriously expect to convince their Muslim immigrants to give equal weight to being French, English or Dutch or American, as to being Muslim. The idea is all the more absurd, because tribal kinship, the family relationships that underlie political loyalties in the Muslim world, are absent here. Muslim immigrants have no familial ties to the political structures of Western countries. Which means that the prospects of expecting them to identity with those countries are virtually nil. In trying to integrate Muslim immigrants, Western countries find themselves pitted against the Mohammed’s Ghost. Mohammed’s supreme idea was that Islam demanded complete submission, transcending all tribal and political bonds. Our supreme idea is that political representation allows law to coexist with human freedom. The two supreme ideas of Islam and the West are naturally incompatible. Muslims view all political laws as corrupt and Allah’s law alone as transcendent. The West preserves political and civil rights by separating civil and religious laws into separate spheres. That is not a compromise that Muslims can truly understand or respect. For all intents and purposes, both sides are speaking different political languages that represent two radically different viewpoints. Our relationships with Muslim countries are based on tribal ties. When we ask one Muslim country to side with us against another Muslim country, we try to outweigh religious ties with tribal ones, something that naturally touches off a domestic backlash from the general Muslim population. The leaders of the Arab world generally understand the necessity of driving out a Saddam or opposing Iran’s nuclear development program, in their own self-interest. But tribal bonds within a country are narrow because only a small portion of the population has direct ties to the government, religious ones however are very wide because most of the population is Muslim. The same problem recurs in the West with Muslim immigrants, except this time our political system, to which they have no allegiance, is pitted against the network of Mosques and their various Imams and religious leaders. It’s no surprise that the West will always lose their showdown for the hearts and minds. The problem is simple enough. The West provides opportunities for Muslims in the West to find jobs, homes, schools and everything that’s considered part of the good life. It assumes that this will produce a natural loyalty. That assumption, like many others, is dead wrong. Political tribalism in the Muslim world ladles out employment and other opportunities based on familial connections and as a reward for loyalty. We “give away” the currency of political tribalism, and in turn wind up treated with contempt by the people we’ve given everything to, with no loyalty asked for in return. Yet even were we to do things the way they’re done in the Third World, it would only make a limited difference. To give up our political system for political tribalism would only further diminish us, and it would not deal with the problem of Mohammed’s Ghost. The Islamic Will to Power is rooted in embracing the “transcendence” of Mohammed’s perfect law, over the corrupt political laws of governments. Since we cannot declare our political laws to be religious, not without creating our own Mohammeds’, and we cannot sell the freedoms that we have already given away to win their tribal loyalty, the problem remains an irresolvable one. And each time we insist that there is no contradiction between being a Muslim and being a Frenchmen, a Brit or an America– we make it that much worse. For Islam insists that there is a contradiction, even as we insist that there is none. Having given up our claim, the Western Muslim naturally moves to appease the cleric by resolving any contradictions between Islam and Western society; in Islam’s favor. And thus the moderate Muslim becomes a Jihadist enabler, if not a Jihadist himself. Given enough centuries of residence, the problem might resolve itself. If Islam did not insist on conquering infidels by the sword, but merely on separatism, the problem would be mainly a social one. If Muslims were not swiftly moving from minorities to majorities across Europe, there might still be time. Unfortunately there is very little time left before Europe becomes Eurabia, and much of the rest of the world will follow. The toxic combination of Saudi wealth, a booming birth rate, a decaying West and the industrialized secularism of the First World colliding with the fanatical determinism of the Muslim world, leaves only two ways for this clash of civilizations to end. One idea, one way of life must win. The other must lose. The great question being decided now in our words and deeds, is which will stand and which will fall. This German dentist who, reportedly, refused to treat a Muslim teenage only because his name was Jihad, didn’t probably know she was declaring her ignorance in public. In fact, the way people deal with such ‘culturally’ labeled first names has been one of the funniest parts of the continuous East–West cultural lack of understanding. Having been called Jihad all my life, I guess I have something to say about this. But firstly, let me tell you something. Unlike what most people think, it wasn’t Muslims who started the use of the word Jihad as a first name. In fact, it was Lebanese Christians and, funny enough, the term was actually used to describe their struggle for justice under the ‘Muslim’ Ottoman empire. Until now, if you happen to meet somebody named Jihad and aged over 60 in the Levant region, he is most probably Christian. The well known journalist Jihad Al Khazen is Christian. A famous Jordanian football player is Jihad Saliba; whose surname is derived from the Arabic word for Cross; the symbol for Christianity. I wonder if the German dentist cared to check if that kid was even Muslim. In an ignorant, dishonest world, where people tend to be comfortable with their ‘lazy preconceptions’, it’s been much easier for many to jump to conclusions based only on shallow factors such as first names. Imagine what would happen if this becomes a global trend: All German nationals or descendents named Godfery could be deemed criminal for having the same name as Godfrey of Bouillon; who, upon invading Jerusalem in July 1099, slaughtered 70 thousand civilian Muslims and put on fire until death 3000 civilian Jews. All blue-eyed people named Harry could also be deemed responsible for Harry Truman’s decision to kill half a million Japanese civilians in 1945. How about such a ‘preconceptionalism’? Shall we bring them all to justice? Oh, I forgot! None of those looks Mid-Eastern or South Asian! They’re innocent! Preconceptionalism! It’s so shallow that if GW Bush believed in it, he could’ve invaded Antarctica instead of Afghanistan. They both have snow! Why is this discussion happening in the first place? Because one of the unjustified consequences of the war on a miss-identified terrorism was in fact a widespread paranoia practiced at various levels. It is not only about first names, but it also includes looks, nationalities and even innocent layman expressions! If we apply what the US media accused EgyptAir’s pilot of back in 1999, Egypt’s number one striptease dancer; Fifi Abdu would be the most dangerous terrorist of all times. She prays before dancing! And she dances a lot! I personally face such a paranoia every time there is an increased tension somewhere on Earth. In 1998, somebody emailed me a death threat in the week after the attacks in Africa… and the only reason was because of my first name! In year 2000, a group of Australian students established an online discussion group to examine how real my name was. Although they saw my name on a technology feature I wrote for an American news site, they hardly believed I wasn’t terrorist and it was just a first name. In 2005, a beautiful girl broke up with me saying she couldn’t tell her family she was dating somebody named ‘Jihad’. At that time, I started asking myself: ‘Am I that, unintentionally, dangerous?’ then it occurred to me that may be people think that parents in this part of the world consult their newly born kids on what names they like. Well, my dad didn’t consult me but that doesn’t make him a terrorist either. In fact, it was a last minute decision in front of the civil clerk after some family member objected naming me Yousef (Arabic for Joseph)! How much of that last minute decision is enough to judge me or anybody else who has the same name? Most parents choose first names based on how they rhythm not their possible political meanings! Nobody names his kid ‘Jihad’ to become a Jihadist!! The current lack of understanding was once described by the Agha Khan in a short, yet wise sentence: “What we have today is not a clash of civilizations… but a conflict of ignorance”. What the German dentist did is just another proof. Sometimes, it’s amazing how ignorance can be correlated to both blindness and insensitivity. If she made a minimal effort to learn about other people and their cultures she wouldn’t have made such a mistake. But the question is; do we really make such efforts? As for me, I think it will be safer to opt for another first name. I found it! The way Federica; an Italian friend, pronounces my name sounds perfect: Jiadde! But, first, let me check if somebody is going to link me to Mussolini! Nowadays, it’s possible! Jihad A Soaileek is a Dubai based communication strategist and a former journalist. Washington Post What Does the MSA Intend? What exactly does the Muslim Students Association stand for? Can we take the stated intent of the group at face value, or is there something more sinister behind the MSA? In May, there was an interesting and disturbing exchange between members of the MSA and writer David Horowitz at the University of California at San Diego. (It was caught on tape and can be viewed online.) Mr. Horowitz was there to counter the MSA’s Israeli Apartheid Week. Given that the MSA members at such rallies have a tendency to display signs that are favorable to Adolf Hitler and Nazism, it’s no wonder Mr. Horowitz felt the need to hold a counterpoint discussion. What is going on on our college and university campuses? How can any school or the media remain silent in the face of this sort of event? Is our government aware of the danger posed by the MSA, which serves as a potential fifth column of anti-Semitic, genocidal and terrorist support? If so, what does it plan to do about it? Spanish MPs will debate barring burqas in public, joining other European countries considering similar moves on the grounds that the body-covering garments are degrading to women, the leading opposition party says. Top officials of the ruling Socialist Party on Sunday indicated they will support the proposal by the opposition Popular Party, making a ban likely unless the country's highest court rules it unconstitutional. A debate in Spain's lower house has been set by the Popular Party for Tuesday or Wednesday, the party said. No vote will be scheduled until after the debate, and Spain's Parliament usually goes on vacation for a month starting in late July or early August. 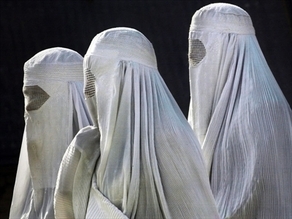 Justice Minister Francisco Caamano said on June 15 that garments like the burqa are "hardly compatible with human dignity". A notable exception has been Britain, where Immigration Minister Damian Green described calls to outlaw such garb as "un-British". France's lower house of parliament overwhelmingly approved a ban on wearing burqa-style Islamic veils on July 13 in an effort to define and protect French values, a move that angered many in the country's large Muslim community. The French ban on burqas and niqabs goes before Senate in September amid predictions it will pass, but its biggest hurdle could come when France's constitutional watchdog scrutinises it later. Britain and France have sizable Muslim minorities that they have sometimes struggled to integrate. Differences over dress – in particular the stark-looking niqab, usually an all-back garment which leaves only the eyes visible – often serve as touchstones for wider discussions about Islam, identity, and immigration. A British Conservative MP has just tabled a French-style bill that would outlaw the niqab, but the bill hasn't received any support for the ruling Conservative-Liberal Democrat coalition and isn't likely to get very far. Belgium's lower house approved a ban on face-covering veils, but it must still be ratified by its upper chamber. Spain's second-largest city of Barcelona in June banned the use of burqas and niqabs in municipal buildings, joining a handful of small towns and cities nearby that have taken similar steps. Britain will not follow France by introducing a law banning women from wearing the burka, the immigration minister has ruled. Damian Green said such a move would be “rather un-British” and run contrary to the conventions of a “tolerant and mutually respectful society”. He said it would be “undesirable” for Parliament to vote on a burka ban in Britain and that there was no prospect of the Coalition proposing it. I dont even know whether I’m black or white??? I condemn the double standards of ‘Democratic west’ towards Muslims. I’m only a Muslim & and I am proud to be a Muslim!!! ALHUMDOLILLAH… Written by a friend.